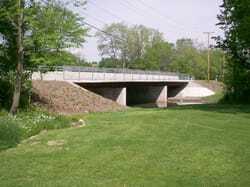 This project consisted of a Feasibility Study followed by a Phase I study and Phase II design engineering services for the replacement of MacArthur Road Bridge in Decatur. The goal was to widen the structure for the addition of a bike path. The Feasibility Study included inspection of the existing structure and analysis of the existing substructure for re-use and for the current truck and pedestrian loading. The study concluded the existing piling would not allow for current loads. No wetlands or environmental issues were present. Phase I study services included the completion of a Bridge Condition Report including a Location Design Study (Reconstruction / Major Rehab). Public informational meetings were held to solicit input from stakeholders and local residents. Phase II design services included hydraulic analysis of the creek and floodplain using HEC-RAS, hydraulic design, complete TS&L, and preparation of the plans, specifications and cost estimates. The new structure is 152' 7" continuous, three span, rolled beam structure on integral abutments and pile bent piers with a 10' bike path on the bridge, as well as, a 12' bike path under the structure. The project included coordination with the Decatur Park District. This project was federally funded with ARRA funds and was completed in 2010 for a total construction cost of $1.4 million.